WASHINGTON (April 23, 2008) -- Americans maintain a connection to the military through the Soldiers that come from their own communities, Army Chief of Staff Gen. George W. Casey Jr. said. During a presentation April 23 at Georgetown University, Gen. Casey said the American public maintains a very real connection to the war on terror through friends and neighbors that deploy as part of the Army National Guard and the Army Reserve -- ensuring that America's military does not become an isolated society. 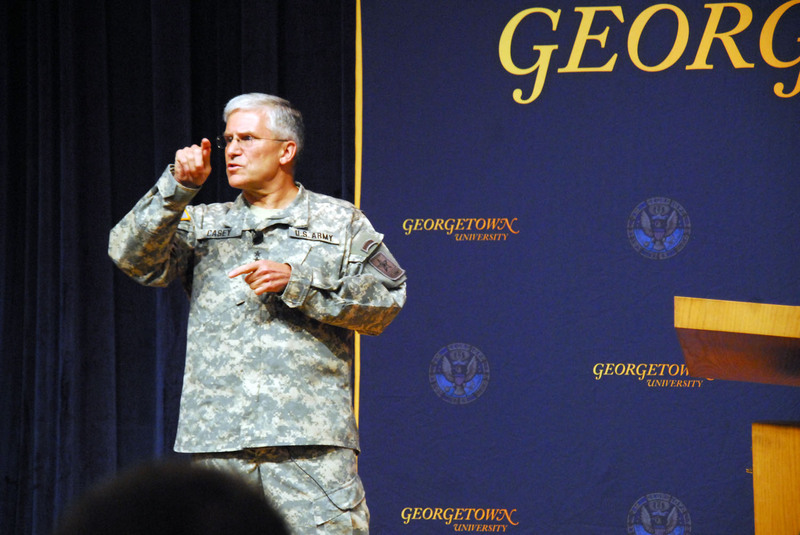 Army Chief of Staff Gen. George W. Casey Jr., spoke April 23 at Georgetown University about the developing trends that will shape the global environment in coming years, and how America's military must be ready to adapt. "Our connection is the Guard and the Reserve -- Guard and Reserve units from all over the country are deploying, and have been since Sept. 11," he said. "That is a connection. As these Soldiers come and go for their mission, that affects the whole United States." The presentation, entitled "Meeting the Challenges of Persistent Conflict in the 21st Century," was hosted by the Center for Peace and Security Studies and the Georgetown Lecture Fund. The general is a 1970 graduate of the university, earning a bachelor of science degree there in international relations. Casey spoke to a crowd of students and Reserve Officer Training Corps cadets from the school about the developing trends that will shape the global environment in coming years, and how America's military must be ready to adapt. Those trends involve globalization, technology and population demographics. "There is no question that the impact of globalization is bringing prosperity to people around the world," the general said. "Unfortunately, that prosperity is unequally distributed." In places like South America, the Middle East and South Asia, the effects of globalization are not as positive as they are in other places, the general said. "What we see emerging is the potential of a 'have' and 'have-not' culture," he said, adding that estimates say about 2.3 billion people will live below the poverty level by 2030. "These have-not groups are much more susceptible to recruiting" by terrorist organizations, he said. The emergence and the distribution of technology is also a trend America's military must stay abreast of, he said. "The same technology that is allowing knowledge to be brought to anybody with a computer and a hookup anywhere in the world, is also being used by terrorists to export terror around the globe," he said. Population demographics are also "working in the wrong direction," the general said. The population of some developing nations are expected to double by 2020, "adding to the already difficult situation ... governments have in supporting their populations." By 2030, 60 percent of the world is expected to live in cities, Casey said. "That says a lot to us in the Army about where we will operate." For the U.S. military to operate in that environment, it must operate with all the elements of national power behind it, including those that exert diplomatic, international or economic power, Casey said. The U.S. military must also be able to work with indigenous forces in the areas it operates. "No great power has ever prevailed in a counterinsurgency without ... a partner," he said. "We are actively working that in Iraq and Afghanistan. It is a different intellectual challenge because doing something yourself is always easier than getting somebody else to do it." The general told audience members the U.S. Army is working now to build a force that is capable of operating in what will be a changed environment in the 21st century. "As we look to the future, taking into consideration persistent conflict and the nature of conflict in the 21st century, we are working to build an agile -- both individually and institutionally -- campaign quality army, with the ability to sustain operations over a period of years to accomplish our national objectives," he said.